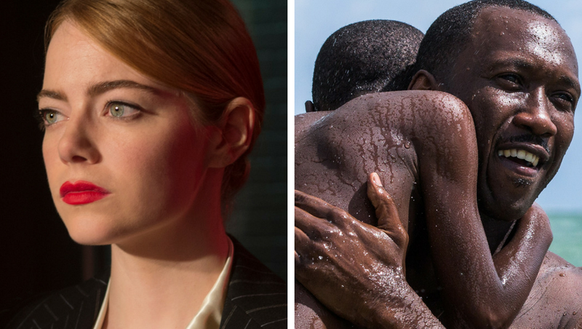 ‘La La Land’ and ‘Moonlight’ are two leading contenders for this week’s Oscar nominations. Awards season heats up this week with the announcement of the 2017 Oscar nominations, previewing Hollywood’s biggest night of the year. After making Golden Globes history with a record seven wins, will La La Land continue its winning streak with a string of Oscar nods? And which come-from-behind candidates will earn surprise nominations? Find out when and where to stream the announcements, which actors will be doing the honors, and which films are in the running for cinema’s most prestigious prize. When are the Oscar nominations? The 89th Oscars nominations are Tuesday, Jan. 24, beginning at 8:18 a.m. EST. Actors Jennifer Hudson, Brie Larson and Ken Watanabe, cinematographer Emmanuel Lubezki, writer/director Jason Reitman and Academy President Cheryl Boone Isaacs will announce the nominations. How can I watch them? The nominations will be livestreamed on the Academy’s digital platforms, Oscars.org and Oscar.go.com, as well as on Good Morning America. Which movies are this year’s favorites?